October 11, 2016. I receive a text from a friend of mine that works at the local university. 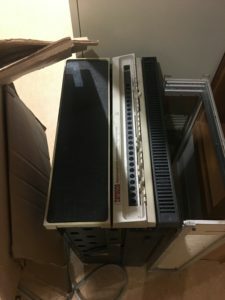 I also found some dec equipment that has been abandon for recycling. I’ll try and snag a picture later if I can make it inconspicuous. A few minutes later, I get the following picture. Definitely DEC. And it has toggle switches! So, we arrange a run to the campus to liberate it from the recycling pile. It turns out that the office of an old professor was being cleaned out, and so we took the opportunity to pop our heads in and ask about the machine. The young kids knew nothing about it, but pointed us to some boxes in the corder that seemed to be associated with it. Goldmine! The boxes contained boards, manuals, paper tape, and other bits and pieces that seemed to be related. With permission, we assisted in the recycling efforts be removing the machine and boxes for them. It turns out the machine is a DEC PDP-11/05. Cursory examination of date stamps on various pieces inside seem to place it at a vintage of 1973. It appears to be relatively complete. Well, it’s 8 months later, and about time to start the restoration. I’ll follow up with posts updating my progress.